As said before: our plan was to leave by 6AM at the latest, but as it often happens, we didn’t quite manage that as that last few tasks in the house took longer than anticipated, and it was not before 6:38AM that we could “get them doggies rollin'”. But that was no problem as, even with a planned trip of 625 miles, we were not in a hurry. We had calculated a travelling-time of 11 to 12 hours maximum, the necessary stops for getting gas and “other business” included. An average of 60 miles per hour is what a long experience of travelling by car has taught us as possible, and this is – provided there are no traffic jams – easily doable. Another advantage of leaving about 40 minutes later than planned: meanwhile it had become light – quite an advantage because there are always deer about in the morning dusk in the Texas Hill Country, and we would have had problems to see them properly in the morning twilight. Wie zuvor schon gesagt: unsere Planung war, dass wir um spätestens 6 Uhr morgens loskommen wollten, aber wie so häufig gelang uns das nicht ganz, denn die letzten Aufgaben dauerten länger als geplant, und es wurde 6:38 Uhr, ehe die Karre ins Rollen kam. Aber kein Beinbruch, denn trotz der geplanten Strecke von 625 Meilen [1005 Kilometer] hatten wir es so eilig nicht. Etwa 11 bis maximal 12 Stunden hatten wir, die nötigen Pausen für Tanken und “sonstige Geschäfte” einkalkuliert, gerechnet. Ein Schnitt von ca. 60 Meilen pro Stunde ist ein alter Erfahrungswert von unseren früheren Reisen, und – vorausgesetzt wir kommen in keinen Stau – auch gut machbar ohne zu hetzen. Was auch noch gut war: es war mittlerweile hell geworden – ein nicht zu unterschätzender Vorteil, denn in der Morgendämmerung in Hügelland von Texas war immer mit Rehen auf der Straße zu rechnen, die wir im Zwielicht der Dämmerung nur schwer hätten sehen können. There’s not much to tell about that trip that day. We got through quite nicely, except for one short traffic jam. But what became quite uncomfortable later: our A/C did no longer work properly, and that when the temperature outside was nearly 95 Fahrenheit and the humidity was quite high! It was just working a little still, but as the fan also wasn’t blowing as it should, the air in the car became quite uncomfortably warm and sticky. And opening the windows while driving 60 mph wasn’t a solution either, with the noise that created. Viel gibt es von dieser Fahrt nicht zu berichten. Wir sind ganz gut durchgekommen, von einem kleinen und kurzen Stau einmal abgesehen. Was uns allerdings später zu schaffen gemacht hat: unsere Klimaanlage wollte nicht so recht, und das bei Außentemperaturen von fast 35 Grad Celsius bei strahlendem Sonnenschein und hoher Luftfeuchtigkeit! Ein wenig tat sie es zwar noch, aber da auch der Ventilator nicht mehr richtig blies, war es dann im Auto doch recht unangenehm warm. Und bei Tempo 100 die Fenster aufzumachen war auch nicht so doll. In Louisiana on I-20 we stopped at a relatively new, large rest stop [other than there it was gas stations] for the “certain necessities”. This rest area looked excellent and the restrooms were spotlessly clean. Absolutely! In Louisiana an der Autobahn I-20 machten wir an einem relativ neuen, großen Rastplatz [ansonsten war es immer an Tankstellen] Pause für die “gewissen Notwendigkeiten”. Dieser Rastplatz sah ausgezeichnet aus, und die Toiletten waren makellos sauber. Absolut! Plenty of Parking-Space for the Handicapped. Move the cursor over a picture to read the capture, click on a picture to read a detailed description. Den Mauszeiger ueber ein Bild bewegen, um die Bildunterschrift zu lesen, auf ein Bild klicken, um eine detaillierte Beschreibung zu lesen. Apropos Toiletten – für meine deutschen Leser: was ich bei Reisen per Auto hierzulande wirklich schätze ist, dass so gut wie jede Tankstelle eine Toilette hat, die frei und ohne Bezahlung zugänglich ist – ob man nun tankt oder nicht, ob man nun im immer angegliederten Laden etwas kauft oder nicht. Und fast immer sind diese Toiletten auch sauber. Meistens haben wir übrigens wirklich etwas gekauft: in aller Regel Mary ein Wasser oder eine Sprudellimonade, ich einen Kaffee. Ach ja, die Toilette auf diesem Rastplatz war in puncto Sauberkeit keine Ausnahme. Im Gegenteil: alle Rastplätze einschließlich der Toiletten waren mehr als gepflegt. 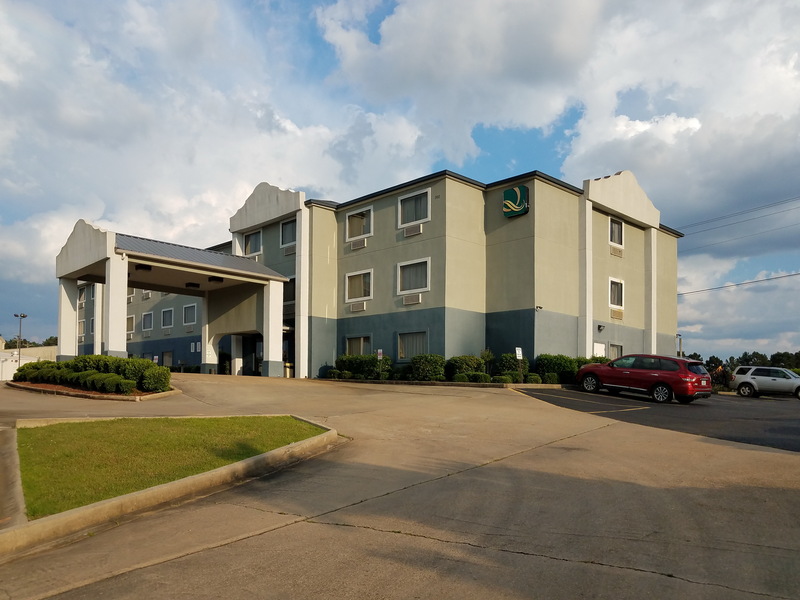 Altogether our trip was faster than expected, and it was only 6:09PM, when, after 627 miles, we arrived at our motel in Pearl/MS, where we really enjoyed the coolness of our room – highly welcome after the heat in the car. As we were on the one hand tired from driving and on the other hand had plenty of food in our cooler box, we didn’t drive to a restaurant for supper but ate in our room from the supplies we had brought, and went to bed relatively early, at around 09:45PM. Insgesamt ging die Fahrt dann doch schneller als erwartet, und schon um 6:09 Uhr, nach 1009 Kilometern, waren wir an unserem Motel in Pearl in Mississippi, wo wir dann die Kühle des Zimmers so richtig genossen haben – hochwillkommen nach der Hitze im Auto. Da wir erstens doch müde vom Fahren waren und zweitens genügend Essen in unserer Kühlbox hatten, sind wir nicht in ein Restaurant zum Essen gefahren, sondern haben auf unserem Zimmer von unseren Vorräten gegessen, und sind relativ früh, gegen 9:45 Uhr, zu Bett gegangen. This entry was posted in Day 1, highways, Hill Country, hotels/motels, Interstates, pictures, Quality Inn, RailTrailsRoadTrip 2018, traffic, travelling, vacations and tagged Interstates, RailTrailsRoadTrip 2018, reisen, Texas Hill Country, travelling. Bookmark the permalink. I wouldn’t have liked the heat in the train car, but you got to your first day’s destination. The hotel looks nice. Now that was a fast comment, Anneli! We didn’t like the air in the car either, but it couldn’t be helped. It was just bad luck that these troubles with the A/C and the fan started on the first day of that trip and persisted – more or less – all the time. I need to take the car to the repair shop here to have that checked. The hotel was nice. It looked fairly new, it was well kept, and we had a large room. As we found out the next day, they also served a good breakfast. And all that for not even $60! It was the most reasonably priced accommodation on the whole trip. Oops! I thought you were traveling by train, because of the title and when you said “car” I thought you meant the “car” (coach, or whatever they call the thing that is part of a train). As you can guess there is very little use of the passenger train in western Canada. Sorry for this blooper. I should read more carefully. No need to apologize, Anneli. I should have explained my title better. It’s “railtrails” because that’s what we are riding our bicycles on: former railway lines, now converted into biking and/or hiking trails. And it’s a road trip as we’re going by car from one place to the other. I see. I thought you were going by train to places where the bike riding was good. Now it makes sense. I’d love to do a long train ride some day. Das liest sich ja alles ganz wunderbar. Ich bin schon gespannt wie es weiter geht. Der Tag war auch prima. Der naechste weniger: immer wieder Wolkenbrueche unterwegs. Aber um es vorweg zu nehmen: wir sind heil am Zielort angekommen. Aber 1000 km am Tag sind auch eine richtige Hausnummer. Ja, manchmal muss das einfach sein, bei den riesigen Entfernungen hierzulande. Uijui, das war ja erst einmal eine richtig lange Strecke, die ihr da bewältigt habt und das noch bei Hitze und nicht funktionierender Kühlung, Chapeau! ja, es war schon richtig lang. Unser “Problem” mit diesen RailTrailsRoadTrips ist, dass die Strecken zu den Staaten, die wir noch nicht abgehakt haben, immer laenger werden. An diesem Tag haben wir dann doch gemerkt, dass wir nur eine kurze Nacht gehabt hatten und reichlich lange am Steuer gesessen hatten. Ich habe zwar unterwegs, als Mary gefahren ist, mal ein Nickerchen gemacht, aber viel hat das nicht genutzt. Und die Hitze im Auto wird wohl auch dazu beigetragen haben. Pit, I like reading about your journey and “gettin’ them doggies rolling!” Mary’s description is beautiful and so are your dramatic skies pictures. You are quite ambitious to drive so far in one day! Also, I wouldn’t be happy about that air conditioning. Did you get it looked at along the way? I’m going to link this up to the post I just wrote today about the journey. It’s a little late, but hopefully some people will see it. I’m glad you liked that post. 🙂 As to Mary’s description: she writes very well, and I’ll include her descriptions once in a while. The skies were really dramatic and threatening sometimes. On tha day were were lucky, though. Not so on our 2nd day of travelling. We got into terrible downpours a few times. But luckily we arrived safe and sound at our destination, Pearl/MS. We had no time to get the A/C fixed, unfortunately. 😦 Sometimes it worked well, sometimes barely. We just had to put up with it. Thanks for linking in your blog to this post here. Well, we didn’t take the car to a repair shop while we were on our trip. We just made do with what little efffect the A/C sometimes produced. I still haven’t had anything done yet, but will see our local repair shop soon. It mostly was bearable in the car. Here, it’s really summer now: 97 Fahrenheit today, plus humid, with quite a breeze from the south, from the Gulf. But we’re happy to have moved here to the Texas Hill Country. It is better than in our previous place, at a lower altitude and much closer to the Gulf. The Texas Hill Country does sound more pleasant. I remember one of the hottest and most miserable places I’ve ever been was Biloxi, Mississippi, right on the Gulf. I’m not surprised about the “four seasons” of Texas! The Hill Country usually has temperatures about 5 to 10 degrees below what it is farther south, close to the Gulf Coast. I don’t know the figures for humidity, but that’s less, too. When we were looking for a place to move to, we also looked at houses on the Gulf Coast, in Port Aransas and Rockport/Fulton, but one reason we didn’t move there was indeed the hot and humid climate. Would be great if you made it here some of these days. Remember:” there’s always a guewst room in our house! Well, I must admit that I’ve checked highway 283 [I believe that’s the one] more than one time, for a trip all along it, from the Mexican to the Canadian border. That would make a great trip I think. Not as famous as Route 66, but that – alas – can’t be done any more. At least not along the original route all the way. I agree: there’s the problem of how to get back from the end. And yes, sad about the “Mother of All Routes”. I can’t wait to post my Route 66 pics. They are so much fun! Die Toilettenanlage sieht schon wie ein kleiner Park aus. Sowas wünsche ich mir auch für Deutschland. sehr viele Rastplaetze an den Autobahnen hier sind echt gepflegt. Auch ich mag Marys Reisebeschreibungen sehr, und ich werde immer wieder welche in die Posts einbringen. Yes, Amy, that day went well. And I really like Mary’s descriptions myself. A long trip but the drive is worth it with that beautiful countryside. It sure was a long distance, but that can’t be avoided here in the US. Gosh, sorry to hear about the A/C. Not the best way to start off a trip. We agree, the Texas hill country is lovely. We’ve camped at Llano State Park a couple of times. Well, we simply had to endure that faulty A/C. And we survived. 😀 Sometimes it worked fairly well, though. But then, sometimes it didn’t. I’m going to have it checked soon. Have you ever tried Enchanted Rock State Natural Area for camping? That’s another fantastic place hereabouts. No, we wanted to try Enchanted Rock but I believe it was booked … either that or we had a last minute change of plans. You know how we roll 😆 How the A/C isn’t an easy one! Well, maybe some other time for Enchanted Rock. My goodness, that was some drive! Especially with faulty aircon. Glad you had somewhere good to rest at the end of it. Lovely sky and cloud photos! This is going to quite the trip if those are any indication. Safe travels. Those clouds were an indication for the next day: we had quite a few really heavy downpours then. Twice they forced us to stop. Btw, we are back from the trip and I’m blogging from home. Always good to respect Mother Nature. Welcome back. That’s quite the day of driving – I would have been exhausted after it! Well, I wouldn’t say we were exhausted, but we sure were quite tired. Ja, die Distanzen hier in den USA. Irgendwie kann ich mich immer noch nicht so richtig dran gewoehnen. Aber es faehrt sich ja wesentlich angenehmer als in Deutschland. Das Hotel war fuer seinen Preis ganz erstaunlich. Oder umgekehrt: es war fuer seine Qualitaet erstaunlich preiswert. Zur Qualitaet der Tolietten hier: bei (den meisten) Rastplaetzen bin ich immer wieder ueberrascht, wie sauber sie sind, und bei manchen Restaurants entsetzt, wie schmutzig. Es gibt Restaurants hier, sogar gute, denen wuerde man in Deutschland wegen des Zustands der Toiletten die Lizenz entziehen.